Students, faculty and staff attend a Cybersecurity Awareness Month forum on the Lake Worth campus. Click image to see more photos. October is National Cybersecurity Awareness Month, and these experts participated in a day-long series of lectures and panel discussions on the state of cybersecurity in the nation and the best ways individuals can protect themselves and their data from hackers and identity thieves. PBSC President Ava L. Parker, J.D. 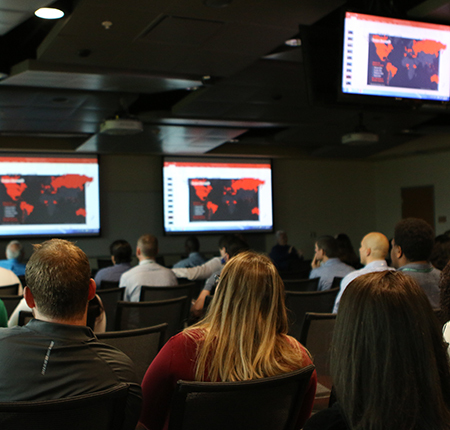 kicked off the Lake Worth campus event, which covered a variety of topics, such as the Cyber Threat Landscape, Preventing Zero-day Threats, Identity Theft, Privacy and the Internet of Things, and Careers in Cybersecurity. One session featured Greg Chavarria, assistant city manager and chief information officer for the City of Hallandale Beach. He gave a talk titled “90 Ways to Stay Safe Online,” based on the free e-book created by his department. 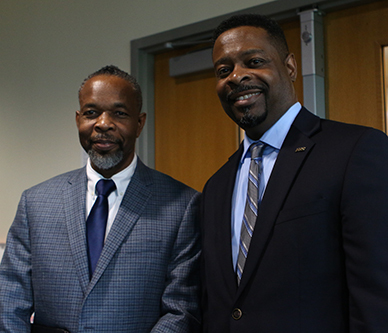 Guy Albertini, PBSC information security officer, and John Sewell, PBSC cybersecurity lab manager, organized the event to increase awareness of the digital vulnerabilities that everyone faces. Visit the National Cybersecurity Awareness Month website for more information, resources and tips. View the photo album of the event. Learn about PBSC’s computer science pathways, from associate degrees to bachelor’s degrees in Information Management, including a concentration in Security and Network Assurance.